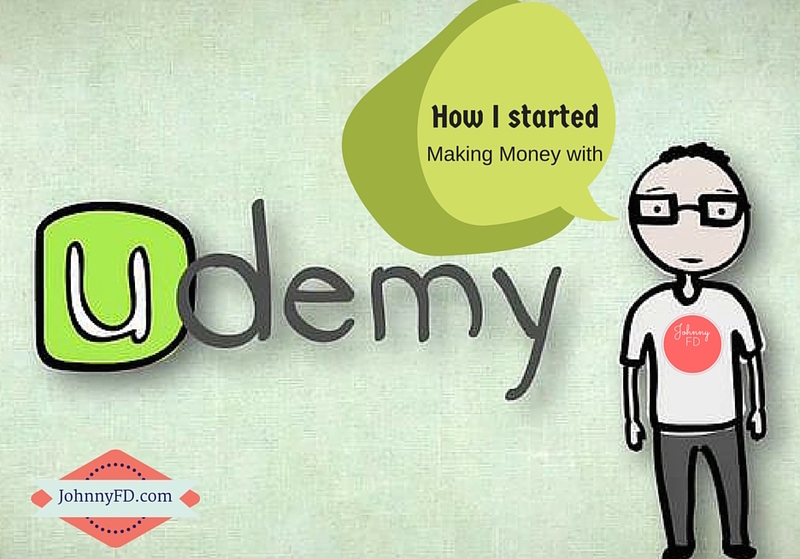 The first time I made a course on Udemy, it was a complete gamble as I had never met anyone who was successful with it and no one that I knew of was publically blogging about their income reports. I honestly should create a course teaching how to make money from creating Udemy courses, but instead here's a free blog post as it's really not that complicated. In this post I'm going to share how I started with Udemy, exactly how much money i've made with them, and who should create a course as well as my 4 steps to getting started yourself. This post has been updated for 2017! I heard of people creating courses but had no idea if it actually worked or not, how to get started or if it was worth my time to create one. My girlfriend Larissa was still teaching English at the time but wanted to have a source of online income as a backup or to potentially replace her teaching salary. At the time she didn't have any specific web or editing skills and our other option was to start a dropshipping store together, which we ended up doing almost a year later, but decided to start with Udemy as her first online business as it was something we could work on during weekends and wasn't as big of a time or energy commitment. Here's an interview where I share the story in detail about how we started creating courses on Udemy and why I share as much as I do even though I know it creates competition. 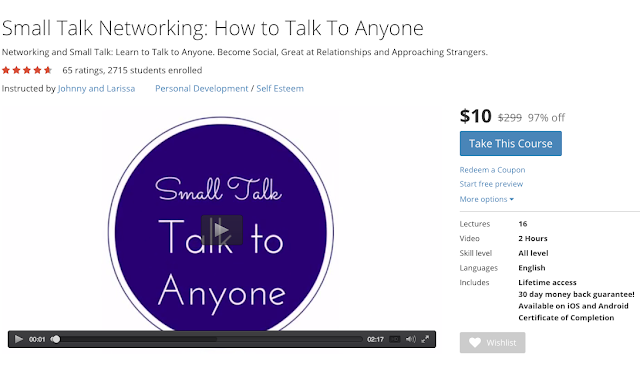 Our first course was called "Small Talk Networking" which we started because Larissa studied Psychology at University and because I studied the topic a lot when I used to be shy and had no idea how to approach strangers whether it was at a business, networking or dating event. We were both interested in the topic, were willing to do more research on it to share, as well as both had personal experience in the topic. We didn't know if anyone would buy the course or not, but taking a look at other similar courses on Udemy, it looked like even a poor quality course with a similar title had 10,000 students signed up so we did the math and thought it'd be a great niche to get into. We later learned that 10,000 students x $249 doesn't mean the course creator earned $2.5 million, but instead it was closer to $2,500 which I'll explain why later. If you want to check out of first course, it's called Small Talk. What's awesome about Udemy is how easy it is to use and get started with. Just go to Udemy.com sign up as an instructor and start creating your outline before you upload videos. Don't name the sections with numbers as you'll end up moving them around quite a bit, so just title them with the subject as they are easy to drag and drop. The biggest mistake we made with our first course is starting each video with an intro which would be nice if people watched one or two videos per day, did the homework and came back the next day for the next video. But we later learned that 99% of Udemy students, just watch all of the videos in one day as they are looking for golden nuggets of info instead of wanting to learn basics. So when creating your course, just assume each video is being watched two seconds after the last one and don't have an introduction or recap the basics. As you can see from our setup photo, it's pretty basic the way we film. Just a white wall in the background, and a webcam. The most important part of having a good quality course is the audio, so get the Blue Yeti which is what I use for my videos and podcast. For video, you can just use the built in webcam as long as it's HD, but if you want better quality or if you have an older laptop like our 2008 Macbook pictured, then order the Logitech 1080p webcam instead. For software, if it's just you speaking, you can use Quicktime which is free or if you are sharing your screen, checkout ScreenFlow or Camtasia. Larissa had no idea how to edit videos when we started, but after watching some tutorials, she's now great at iMovie so anyone can do it with a bit of dedication. You can also use Windows Movie Maker which is free for PCs. The hardest part about creating a successful Udemy course is how you promote it. Udemy is a great platform as they have their own built in user base and will advertise on your behalf, but only if your course is already doing well...which is a catch 22. My suggestion is to do a bit of promoting yourself when you first launch to attract your first 50-100 students and get some reviews. You can give away your course for free in facebook groups, forums, or even just to friends which is what we did when we started. Then you can create $10 coupons to encourage people to sign up without a huge investment which looks better in Udemy's point of view than having a bunch of free signups. 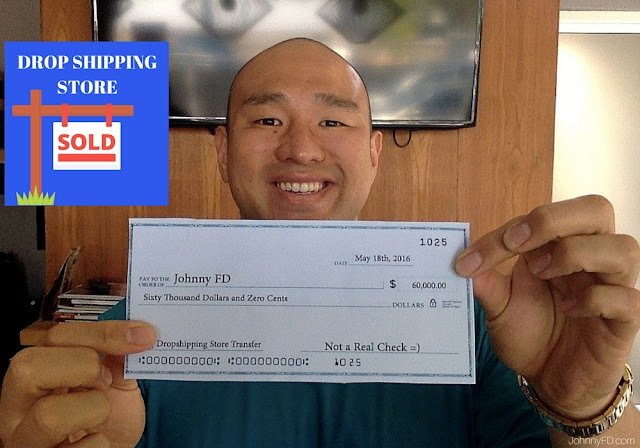 What's nice is once you start sending your own traffic to your course, Udemy will do the same and promote for you as well which is why last month I got paid an extra $203.11 from "Udemy Organic" traffic on top of the money I earned from my own promotions. In total, since we started selling courses on Udemy in September 2014 we've made close to $4,764 each since Larissa has her own account on Udemy and we split all of our course profits 50/50. The upside of Udemy is that it's very easy to start and the barrier to entry is extremely low. You can get thousands of students quickly and relatively easily and the income is almost completely passive once you have your course live and the ball rolling. The downside however is the payouts are extremely low per student and the platform encourages you to price your course at $300 while in reality, your courses sell for between $10-$15 after massive discounts. This discourages instructors to put in the time and energy required to create extremely high value courses. Also these students are the property of Udemy's platform which means you can only message them through Udemy and you never see their email address. 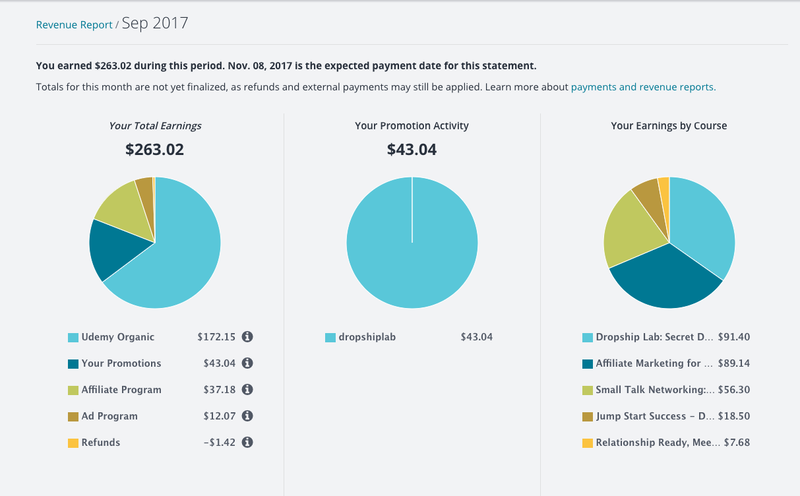 If you look at our lifetime payouts above, you'll quickly be disappointed that even with 1,456 students and a 5 star rating our latest course, Relationship Ready has only made $680 total (50/50 split) since we launched it in October 2014 which to some is a great stream of passive income but for others it's not a good use of your time. Should You Teach on Udemy? 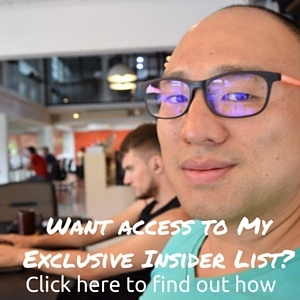 If you have no idea what else to do and want your first stream of semi-passive online income then Udemy is an awesome platform especially if you're from a country where it's hard to get into ecommerce or dropshipping such as South Africa or Poland. Follow my 4 steps above to get started and let me know if you get stuck anywhere in the comments section and I'm happy to help. However, if you're serious about creating an online training course and want to make $2,000+ a month instead of $200+ and don't want promoting the course yourself, with paid ads or through affiliates, then I would create your own platform. Even though it would have been a lot easier for me to put my new course on Udemy as I already had experience with it, instead I paid $2,000 to create my own site as I knew it would be more profitable in the long run which allowed me to justify investing 3 months of my life into creating a super high quality course, give away all of my confidential secrets and continue to update Earnest Affiliate. 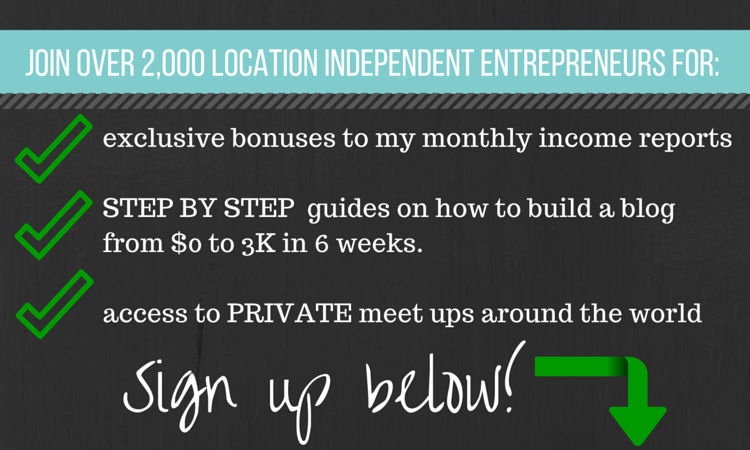 I hope this guide helped, and it encourages you to grow or start your online income streams. 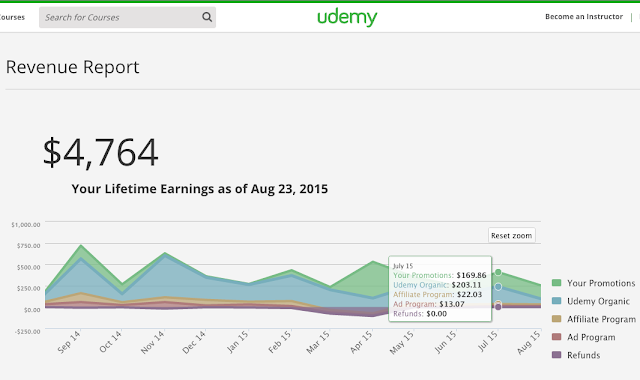 Total profit earned from my Udemy courses! A lot has changed since I first wrote this post. Larissa and I are no longer dating, but we both continue to make money from our Udemy courses even though neither of us have been actively promoting the courses or doing any work on them. It's a 100% passive stream of income that continues to pay us even 3 years after we made the course. What's also nice is that Udemy automatically splits the profit of the course for us, and we each get paid individually. Last month we each made $56.30 from our course Small Talk and also each made $7.68 from our course Relationship Ready which means in total last month we each made over $60 in passive income from doing nothing, since the courses were filmed and created years ago. You'll also notice from the screenshot of my dashboard below that 84% of our monthly earnings came organically from Udemy and only 16% of the sales came from my own promotions, meaning that Udemy is doing the marketing for us! As much as it's nice to make a bit of passive income from Udemy, at the end of the day $263 isn't that much money compared to how much I could have earned on my own which is why in 2017 I switched from using Udemy and even Wordpress to using Teachable instead for my new course Income Boss. 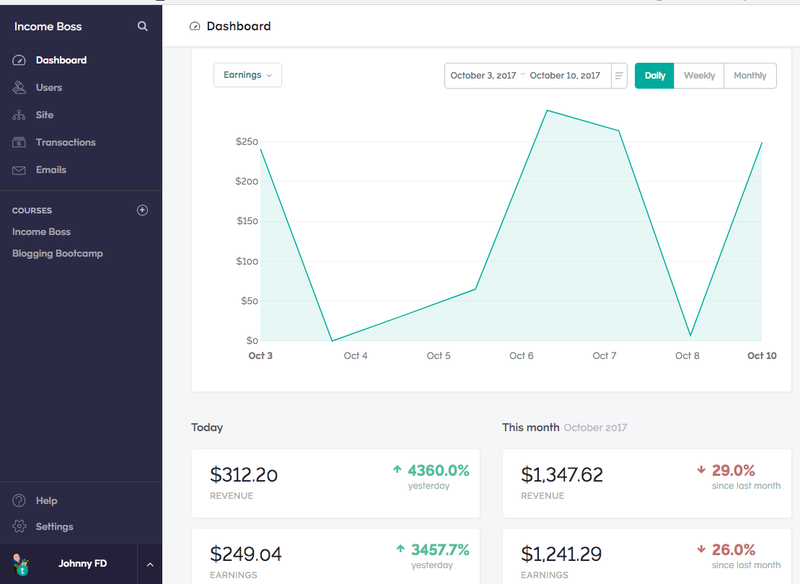 I'll write a full review of Teachable soon, but the main benefit is the fact that it gives you more control of how you make your site look, how you price your products, and it allows for you to completely white label it so you can have it on your own domain name and keep control of your own customers. The reason why I switched from Wordpress is because it was a pain having 6 different moving parts which would often need updating and break for no reason. I used a combination of Wordpress, Wishlist member, Sam Cart, Simple Press, and a bunch of other plugins which was a huge headache that often didn't work correctly. My suggestion for those who want to get started is to start with Udemy if it's your first course with the expectation that most courses will sell for $10-$20, keep a copy of your videos in dropbox, then move it to teachable once you start making more than 10 sales a month consistently or when you know for sure someone will pay more than $50 for your course. Can you manually set the price of your course to $100 or $200 or $300? Will Udemy just drop your sale-price to around $20 through discounts? Don't we have any control over that? I am in the process of creating my first Udemy course and would like to learn more about self-promotion. You mention posting on coupon sites? Could you please share a few more tips, resources and perhaps sites? Hey Leroy, the best would be forums or groups that are similar to your topic. Or if you just want general signups you can search facebook for "udemy coupons" or "free udemy courses" and post them there. Although, I've stopped giving away free coupons for my courses all together. What this mean then, If you have 2000 students and You get $5 from each sales then how can you get few cash? 50/50 udemy mean 10$ course and you get $5 so if you have 500 students then 500x5 2500? right or something is hidden? Hey Saqib, most courses have hundreds or thousands of non-paid students inside of them just to make the courses look more popular for marketing reasons. So if a course has 2000 students, most likely it only has 100-500 paid students. Hey Robb, it's definitely doable and has low barrier to entry. Yikes, $680!? Do you know how much time you spent creating the course? I think that course took us around 3 weeks to make in total. Even today that course has only made us $916 in total, so ($458 each) which wasn't a very good use of our time. However, our other course Small Talk has made us $4,375 in total which was a great use of time. So it all depends on which niche you get into, and how you market it. Thank you for providing us with all of this info. Do you plan to make any more videos? Thank you very much for your article. I have a lot to consider before the investment of time.